Babyllon Garden Products Design, Create and sell Plant Supports for many gardening uses - This range includes the Babyllon Twister Garden Supports and the Babyllon Spirals Supports. There’s nothing like having plenty of plants around. They bring such freshness and pleasure into life. But some plants need a little help in order to survive and grow healthily, and having good plant supports is very important for many varieties of plants. are a great innovation, and you’ll find this excellent product on sale via Babyllon Garden Products. Recently demonstrated on BBC television’s Gardeners ‘World, spiral supports are just the job for training and supporting many tall, multi-stem plants including Peonies, Delphiniums, Lilies, Lupins and Roses, to mention but a few. The great thing about spiral plant supports is that they are so easy to use. You don’t have to strategically position them months in advance, and then train the plants to grow through them, you can actually deploy them exactly when you need to. Not only that, but you can use them on plants that are fully in bloom without doing any harm to the plants or their blooms. These multi stem plant supports are made of galvanised steel, so they won’t rust. All you have to so is simply wind them onto your plants and hey presto – instant support! If you find that you need your spirals at different heights, simply fix them using hollow canes cut to the specific length the plant demands. 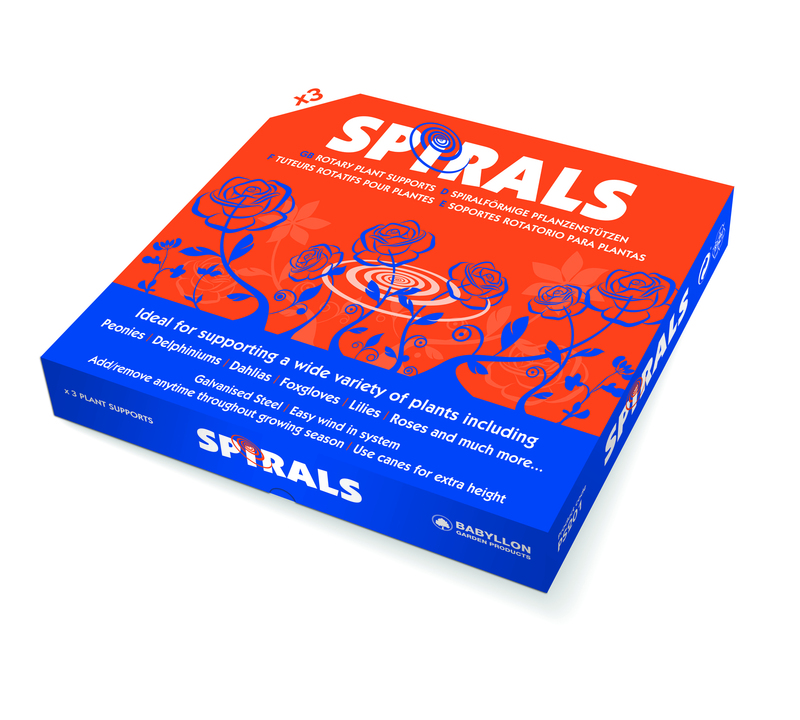 Babyllon sell their spiral plant supports in packs of 4. You can order them online from their website, and have them delivered direct to your door. The inexpensive price includes post and packing. Twister plant supports are another one of the user friendly plant supports that you can obtain through Babyllon. Once again they are made from galvanised steel for durability, wear and tear, as well as for value for money. 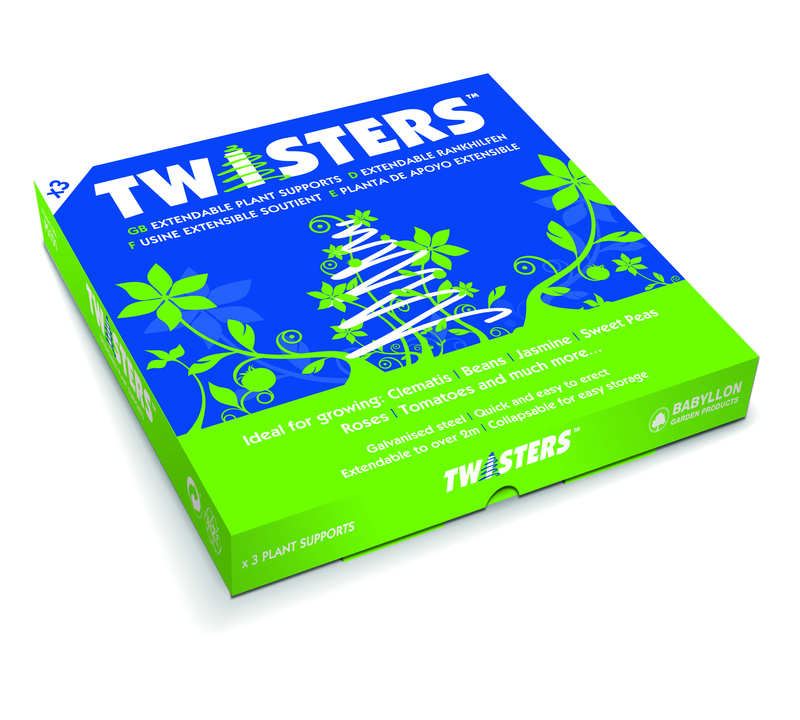 Twisters are a simple innovation that are great for training climbing plants and are superb for many vegetable plants too including tomatoes, runner beans, and peas. In their flat state, Twisters measure around 320mm. You can stretch them, (rather like unwinding the coils of a spring), up to a height of 2.1 metres, around 7 feet for you imperial measurement gardeners. Twister plant supports come with a set of pegs which are used to fix the bottom of the support into the soil. You will need a length of cane which most gardeners have in ample supply. Simply cut your cane to the required length and secure the hooked end of the Twister into the hole at the top end of the hollow cane. Once secure, stretch the Twister down the length of the cane and secure into the soil below using the pegs supplied. Neat and simple! These plant supports are fine for both indoor and outdoor use. Once they have outlived their purpose, you simply unclip and un-peg them, concertina them back into their flat profile, and hang them on the walls of your shed until they are needed again. They really are a superb innovation; simplicity in itself, like all the best inventions. If you would like to buy plant supports online, please view our range of products and buy online today!